knit. sock. love now in German! Knit. Sock. Love. is now available in a German edition with a new cover! I was actually initially considering this photo (with Sake) for the cover, so it’s exciting to see it on the German edition. 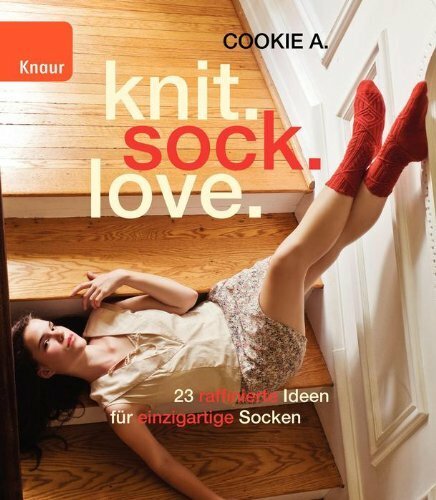 Google Translate tells me that the subtitle says “23 clever ideas for unique socks”. I know there are a lot of German-speaking sock knitters out there, and I’m delighted to be able to share these patterns with them more easily! This entry was posted on Wednesday, December 12th, 2012 at 11:05 am and is filed under Knit. Sock. Love..	You can follow any responses to this entry through the RSS 2.0 feed. Both comments and pings are currently closed.